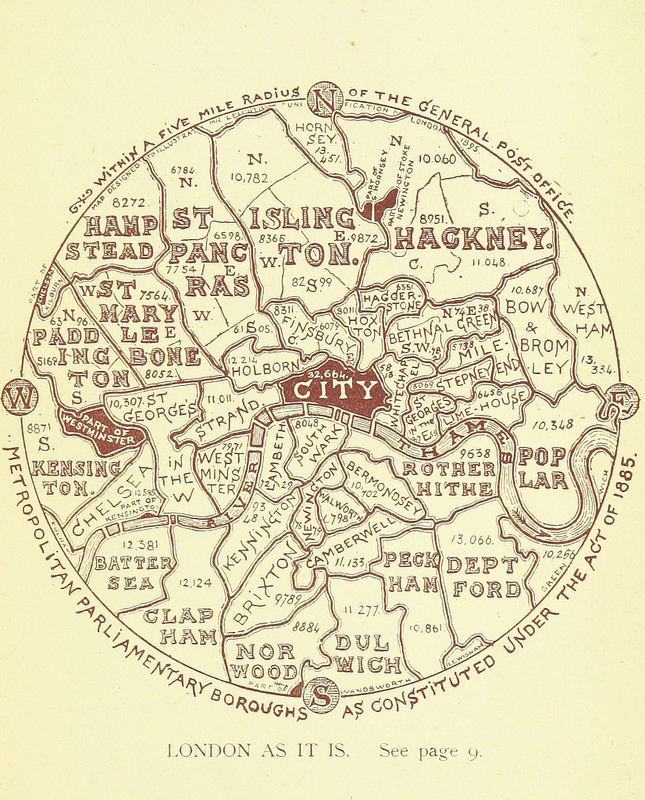 This map is taken from an book “The Unification of London: The Need and the Remedy” written by John Leighton and published in 1895. 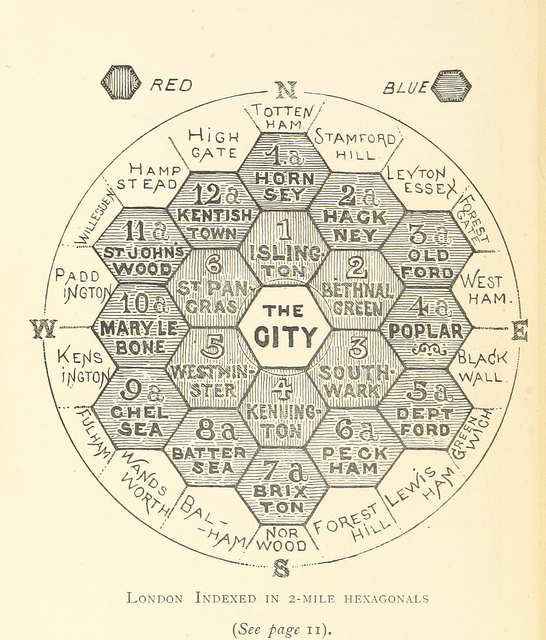 London is split up into neat hexagons, colour-coded according to their proximity to the centre of the metropolis (defined as St Paul’s Cathedral rather than the more normal Charing Cross.) 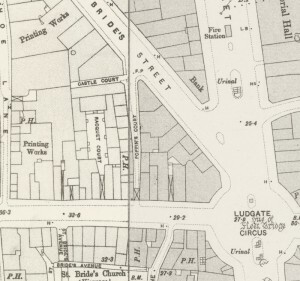 The map is made available as part of the British Library‘s releases to Flickr’s Commons project – the UK’s top reference library donated over a million images to the project recently. You can see all the graphics from the book here and download the book itself as a PDF here. 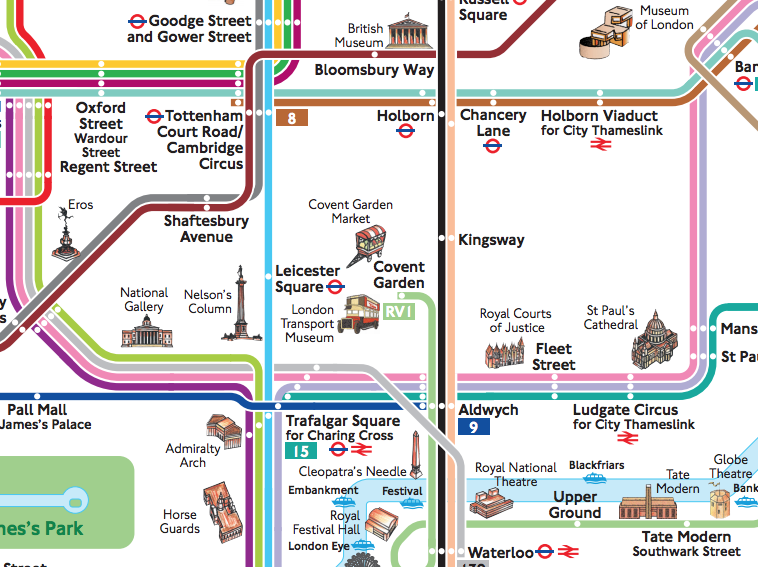 It looks like John Leighton was proposing a wayfinding system for London based on each area’s “zone colour”. Lamp posts would be used, with one handle always pointing to the north to orientate people, and colours, numbers and letters to show the zone. Bus blinds would have multiple colour indicating the zones buses passed through, and taxis would use appropriately coloured lights to indicate where they were willing to go. 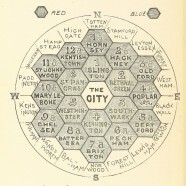 In a way, the idea of a uniform signposting system across London, across multiple objects and devices, is kind like the London Legible project, only 110 years earlier. What is more odd about this is that London already had its postal districts – N, E, SE, SW etc – defined, thirty years before the publication of this book. This additional system would have been very confusing. 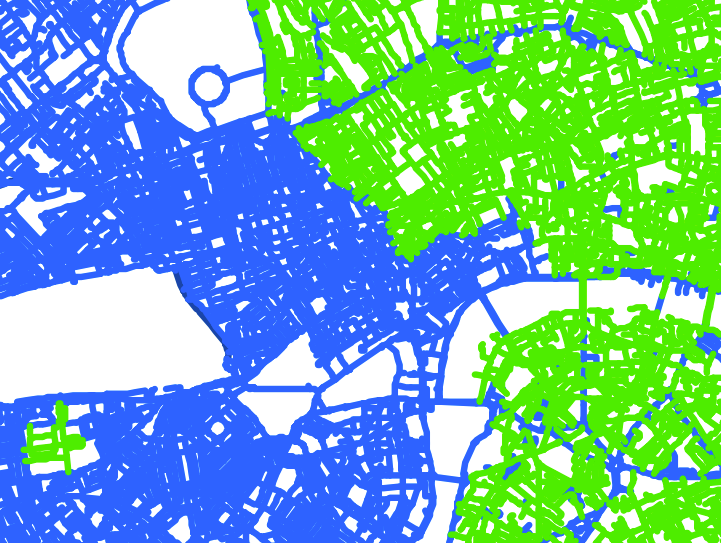 See also – London as a series of squares and London as a series of blobs. 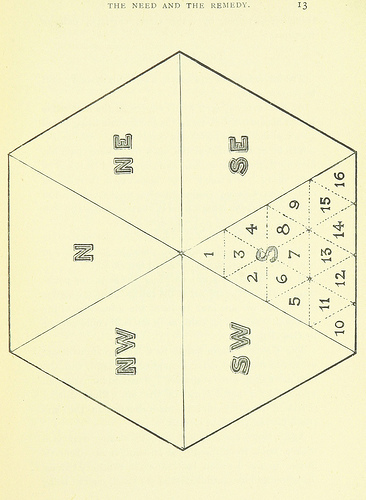 Thanks to the British Library and to the Flickr Commons project. You can view the British Library record for the book. This is what happens when you stay up all night playing Settlers of Catan before going to work. It’s early days yet and the listings at the moment are still pretty incomplete — but with luck the index will grow and grow over the next days and weeks, if everyone finds and adds things. I love old maps and this is one of the best I’ve ever seen. 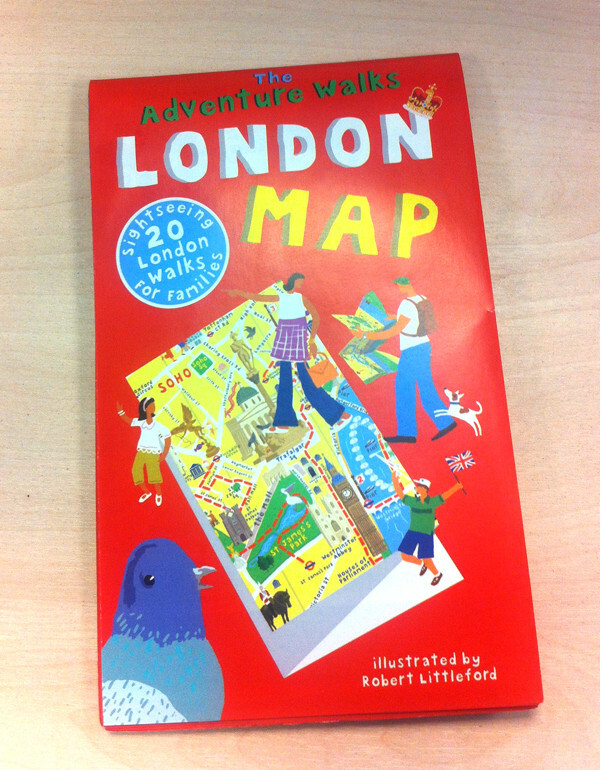 A very particular map of London, absolutely different from those more classical but very intriguing. What a brilliant idea; I think he was on to something. The postal districts were, and still are, completely irrational and give you no idea where anything is actually located unless you consult a map that happens to show their weird, wandering boundaries. 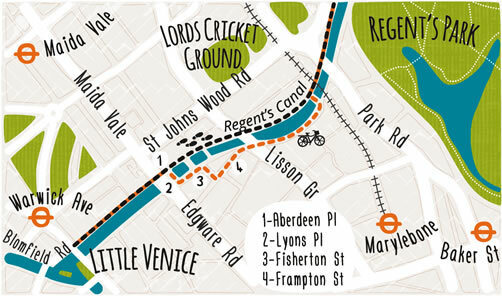 Where on earth is SE20 in relation to N5 – who knows without checking a map? This is more akin to the logically numbered Parisian arondissements. We may be used to N, E, S and W, but until the advent of the Northern Line (N to S) and Central Line (E-W) (and now Crossrail, also E-W), most trips were diagonal, so a hexagonal tesselation makes good sense. The idea of colour-co-ordinating lamp-posts and presumably other street furniture plus bus destination blinds is a stroke of genius. 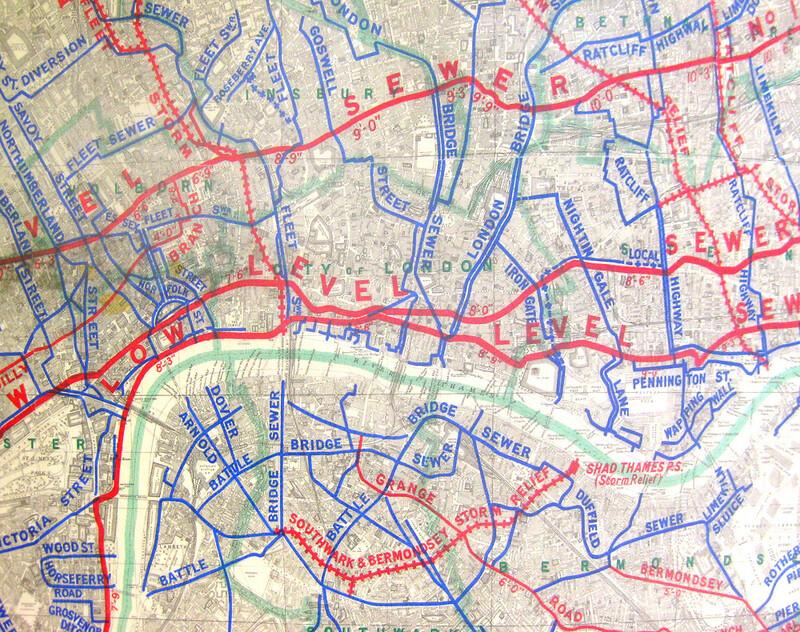 It presages colour-coding of London’s Underground (and later, to a lesser extent, mainline) railways. In the long term he’d have run out of colours and I suspect the whole thing might have become hopelessly unwieldy, but full marks for trying. Far too logical, though, for ‘muddle through and hope for the best’ Brits! We’re stuck with people wandering heads-down, zombie-like, trying to find their way along pavements with satnav and drivers blundering up one-way alleys.